We'd like to think we're the experts on humanity, being, as we are, human. Alas, this is clearly not the case. Not that there is anyone, or anything else that is more expert, but our own knowledge of humanity seems quite limited. To a certain extent, we invent humanity simply by living our lives. Science fiction has often posited that the technology we possess cold be used to refine that notion of humanity. It's an easy to trope to grasp, which in a sense makes it difficult to use with any originality. And even originality can be overrated. Margaret Atwood plays with all the standard ideas about invented humanity — and other critters — in her 20093 science fiction novel, 'Oryx and Crake.' You've got gene spliced half-this's and half-that's running amok in a decimated post-apocalyptic world, you've got designer babies — all the standards that have been paraded before us by talents ranging from A. E. Van Vogt to Aldous Huxley. What distinguishes Atwood's novel is her storytelling style, her use of layered narrative to create tension as she reveals just how she's decided to build her world. You've also got a future that includes a big chunk of narrative set in the actual present and a writer canny enough to know that any future she might describe is in effect a virtual present. 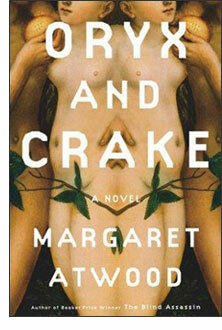 With Oryx and Crake,' Atwood literally proves that she could write a grocery list that would be compelling as a science fiction novel. Atwood spills out her story across two timelines, one set in a near future that's very much like the present and one further down the line when things have all gone to hell. In the near-future storyline, Jimmy is a minor league kid who drifts through the gated compound where he grows up and meets, Glenn, later to become Crake. Crake is a gifted genius, who makes a beeline for a job in genetic engineering, and succeeds. Farther down the line, Jimmy, now Snowman, finds himself dealing with the results of Crakes efforts. Atwood's feat here is to present the reader with a world itself that is a puzzle and a plot-driver. By jumping back and forth, she skillfully teases and rewards the reader as she slowly reveals just what happened to turn the world into the surreal hell-scape we encounter on page one. She has a very funny and very dry sense of humor that leavens the dire panorama we find ourselves in. There are no jokes per se, just a series of wry and entertainingly flat perceptions that play on our expectations. While there is not a plethora of originality in her science fiction vision, it’s certainly compelling enough to make even genre veterans want to find out what's the deal is. But Atwood makes us care enough about her characters so that there's a lot of power to the revelations of character as well as world, and the pace at which she feeds us information about both is expertly managed. Her prose is precise but not fussy, and her characters are flawed with the effect of giving readers the impression that we're getting intimate details about the inner lives of people we might know – were they to either be creating or living in a world of genetic engineering gone quite wrong. Atwood takes aim at corporate greed, at the abdication of personal responsibility, and at how the sheer complexity of modern life leaves us at risk, with great effect. The humor keeps things from getting obnoxiously pretentious and her storytelling skill keps thenarrative truly gripping. 'Oryx and Crake' does not re-invent either literature or science fiction, but it does a damn good job of putting each in the service of the other. Atwood turns what could be weaknesses into strengths and moderates the natural strengths of each form with humor to keep the book itself more likable than some of the characters. She tells one hell of a story that has aged well, and leaves the reader wanting more. This is a rather remarkable achievement, because the more we're left wanting is a world we must surely hope could never come to pass. Agony Column Podcast News Report : A 2013 Interview with Hannah Kent : "...it felt like some kind of kinship..."
Agony Column Podcast News Report : A 2013 Interview with Paul Harding : "I'm just there to take it down..."
Agony Column Podcast News Report : A 2013 Interview with Nicholson Baker : "...I did all sorts of things to get the voiceiness..."
10-14-13: Commentary : Jonathan Lethem Plants 'Dissident Gardens' : How Does Your Family Grow? Agony Column Podcast News Report : A 2013 Interview with Jonathan Lethem : "...we resist thinking about these things, and then suddenly it will become quite urgent figure it out, wait, where do I come from..."
Agony Column Podcast News Report : A 2013 Interview with Temple Grandin : "Well, I don't want to get cured." Agony Column Podcast News Report : A 2013 Interview with Mark Epstein : "...it's hard to have a decent relationship if those early relationships are fraught...."
Agony Column Podcast News Report : A 2013 Interview with Connie Willis : "...you have so little control and not nearly enough information..."
Agony Column Podcast News Report : A 2013 Interview with Marisha Pessl : "... there is this mad need to leave your story behind..."